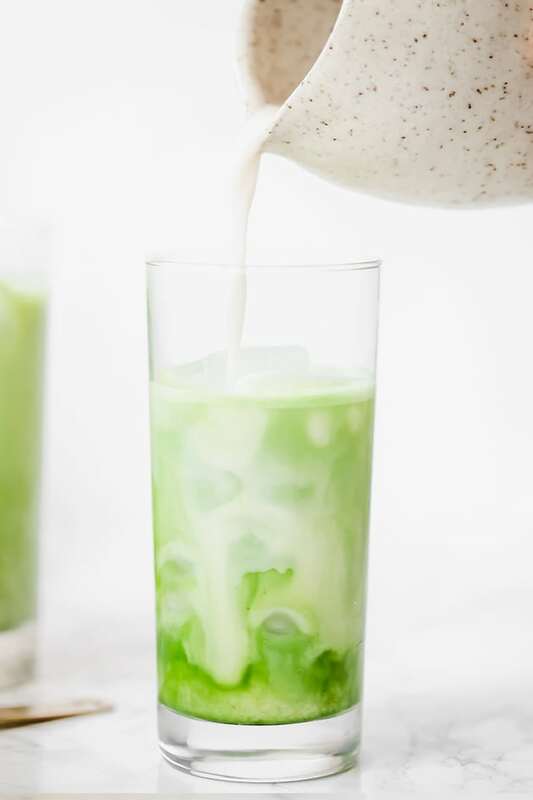 This iced matcha latte is the perfect pick me up. It’s easy to make and tastes delicious! Matcha is so trendy right now… like, incredibly trendy! I had never tried matcha until about a year ago. I was intrigued by the bright green color and the fact that everyone was so obsessed with it. It only took about one try for me to start obsessing over it too. I would go to my favorite coffee shop once a week to get my fix, but it was getting expensive. 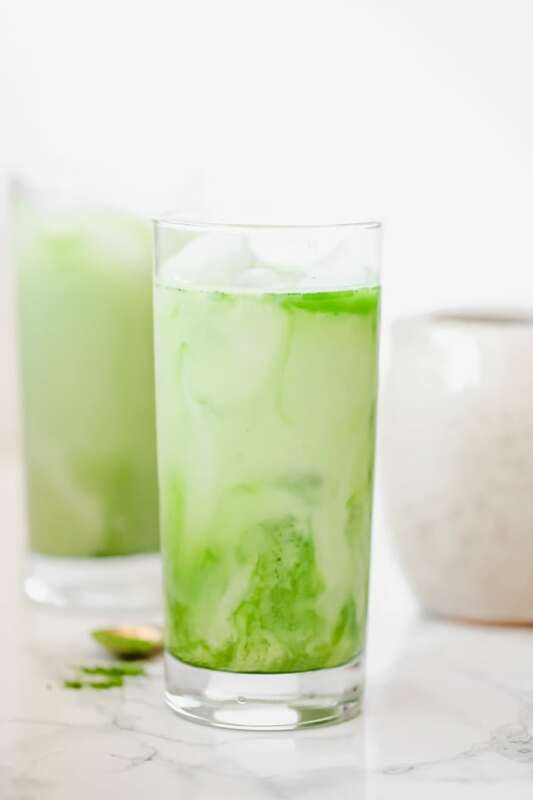 I wanted to learn how to make a killer matcha from home, and I’m finally sharing my Iced Matcha Latte recipe! Matcha is a green tea powder. Ah, so that’s what it is! Think of it as basically a concentrated green tea powder. All of the antioxidant benefits, and a similar flavor to green tea. Matcha is an acquired taste. Not everyone like matcha. I totally get that. If it’s not for you, don’t force it. However, if you like green tea, you’ll probably like matcha. Matcha is not caffeine free. Those who are healing from adrenal fatigue or are intolerant to caffeine need to keep that in mind. However, matcha is metabolized more slowly than something like coffee, so many who have issues with coffee find success with matcha. For me, it doesn’t bother me at all! Yes, it is AIP! But you should be mindful about the caffeine. Yes matcha itself is AIP compliant, but you should be mindful about the fact that it does have caffeine. The brand matters… a lot. An iffy brand of matcha powder will totally ruin your latte. Trust me, I’ve tried some shady matcha. The brand I’m using here is Ippodo Tea and it is delicious! This is the brand that I use, but feel free to use your favorite. I’m obsessed with the 4th and heart vanilla bean ghee! It adds so much flavor to the latte as well as healthy fats. You can either leave it out of sub coconut oil if you’re AIP. This helps to ensure that there aren’t any clumps in the matcha. It’s an optional step and I often skip it and have no issues, but you may prefer to do it this way. Matcha needs to be blended to be properly prepared. Traditionally, you would use a matcha whisk, but I’m using a milk frother here to keep things simple! Using a small sauce pan, warm the water over medium heat and melt the ghee (or coconut oil). Don’t allow the water to boil. Add the matcha powder (see notes about optional sifter) to a glass and pour over the water mixture. 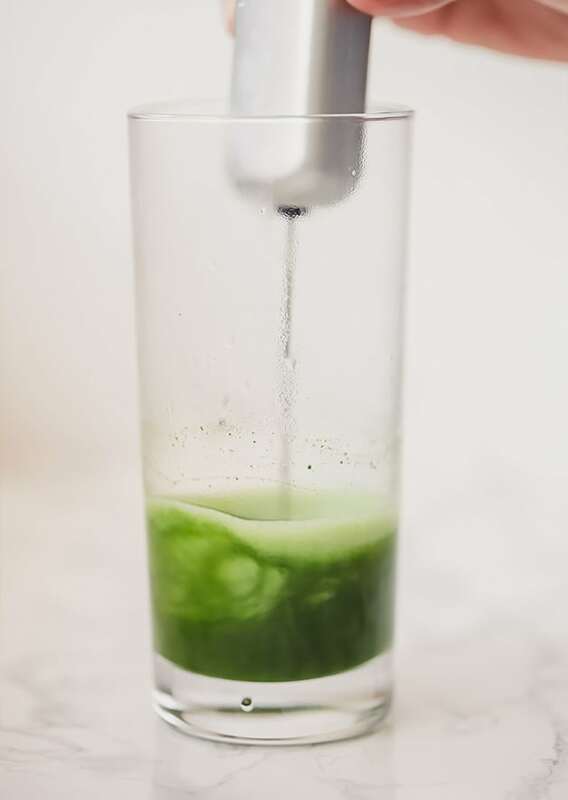 Use a milk frother (or matcha whisk) to create a paste and ensure the matcha powder is fully blended. Pour in the ice, coconut milk, optional honey, and stir well until combined. If desired, use a sifter to sift the matcha. This helps ensure that the matcha doesn’t clump!